The Edinburgh Art Festival was established in 1947 and is one of the oldest and largest arts festivals in the world. 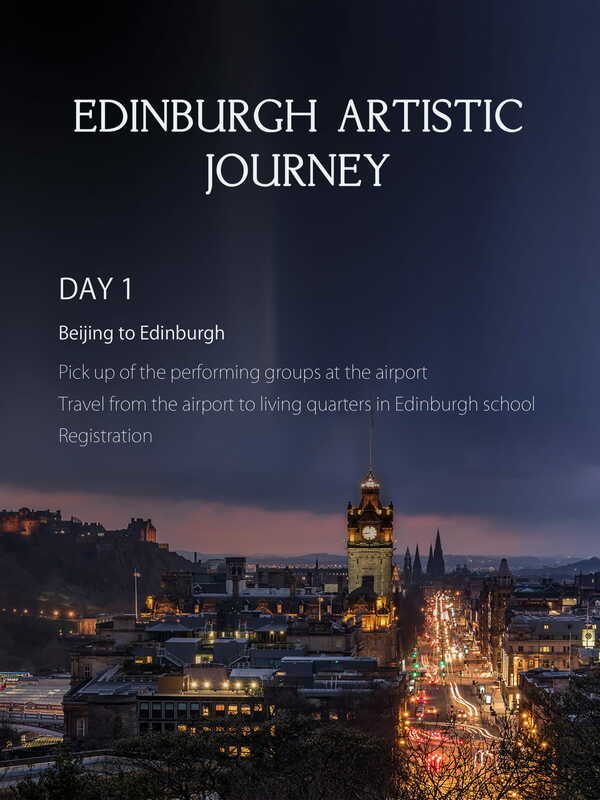 Each August, art lovers from all over the globe gather together in Edinburgh. 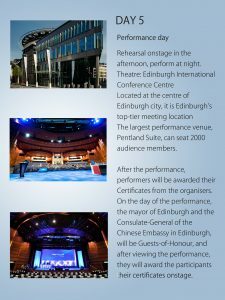 Several festivals occur here at the same time: Edinburgh Fringe Festival, Edinburgh Art Festival, Edinburgh International Jazz and Blues Festival, Edinburgh International Film Festival, Royal Edinburgh Military Tattoo, and many more. Multiple artistic and cultural events, performances and exhibitions, paint the streets of Edinburgh. 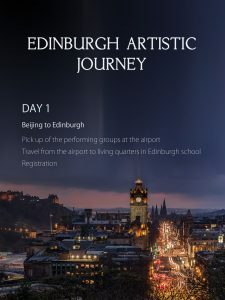 As one of the many festivals under the umbrella of the Edinburgh Art Festival, the Chinese Art and Culture Festival aims to promote Chinese culture on an international stage, so as to provide more opportunities for Chinese artists to create works for an international audience. After selection, each selected group will receive an invitation letter from the organisers to attend the festival in Edinburgh. 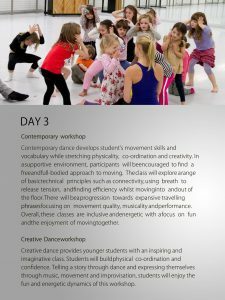 Each participant will also receive a Certificate of participation, and the choreographers and rehearsal directors will also receive Certificates of choreography. There will be more than 100 different arts companies from around the world attending the festival. Besides being able to observe these different cultures and companies, we will have opportunities to get to know them better. There will also be dance master classes conducted by local experts. During the 10 days we visit Edinburgh, Lake District, Oxford, London visiting historic and cultural experiences offering the children educational and cultural insights into life in the UK. The education of the Imperial Seal was established in early 2015, and it is a professional educational institution focusing on system and science and art education. Founder Huang Yue, graduated from Shanghai Dance School, Air ensemble famous dance artist, has served in the PLA Art Institute Dance Department. Seal education always adheres to the professional, pure, happy dance purposes. To the most professional scientific teaching system, leading the children into the hall of Dance art, with the dance to create a child “true, good, beautiful” art world. In order to carry forward the Chinese traditional culture and the essence of art, the seal of the more education to create a professional children’s troupe-pure Dance children’s art troupe. Xi Yue Pure Dance art Troupe is a direct guide to the management of the education group of the Professional Children’s art groups. Founded in 2012, WHY BALLET is a professional ballet dance training centre. In recent years, the development of dance education has been greatly supported by the community. Our school introduced England RAD and Russia Vaganova Teaching methods … the fusion of classical and modern ballet. In training students to perform, musical perception, body expression, The body coordinates and shapes the body. Training etiquette，To improve the physical and behavioural qualities of students，To achieve both internal and external studies. Let students have self-confidence and distinctive temperament. About the school: Ballet Etoile® Shanghai is focused on training young people and promoting the art of dance. Since its founding in 2011, it has been dedicated to the philosophy of a many-sided education that includes the arts, focusing on the teaching of classical ballet. It offers three different systematic courses in ballet (RAD, BDA, and CSTD), geared towards students aged 3-16. It is also an official RAD examination centre in Shanghai, as well as the only company in the city which is a member of the Sino-French cultural exchange association. Its students regularly have the opportunity to perform, attend masterclasses, and take part in competitions internationally. Observe different performers from all over the world. 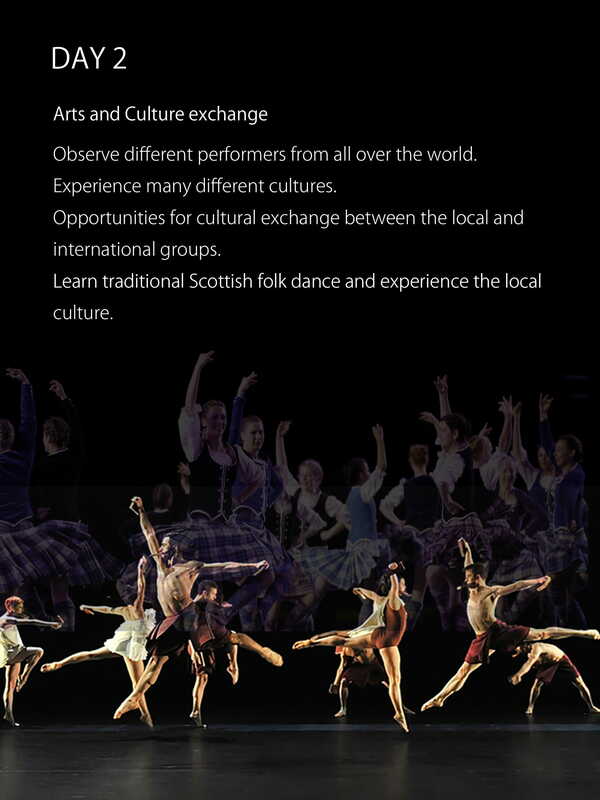 Opportunities for cultural exchange between the local and international groups. 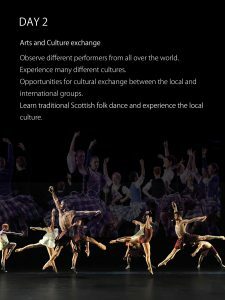 Learn traditional Scottish folk dance and experience the local culture. Creative dance develops studentʼs movement skills and vocabulary while stretching physicality, coordination and creativity. In a supportive environment, participants will be encouraged to find a free and full-bodied approach to moving. The class will explore a range of basic technical principles such as connectivity, using breath to release tension, and find efficiency whilst moving into and out of the floor. There will be a progression towards expansive travelling phrases focusing on movement quality, musicality and performance. Overall, these classes are inclusive and energetic with a focus on fun and the enjoyment of moving together. Students will build confidence and explore travelling dynamically through space. The workshop will include barre warm-up and adage leading to short movement phrases, turns, jumps and travelling. And the class will focus on developing body alignment, technical accuracy along with movement dynamics, and flow. Rehearsal onstage in the afternoon, perform at night. Located at the centre of Edinburgh city, it is Edinburghʼs top-tier meeting location. 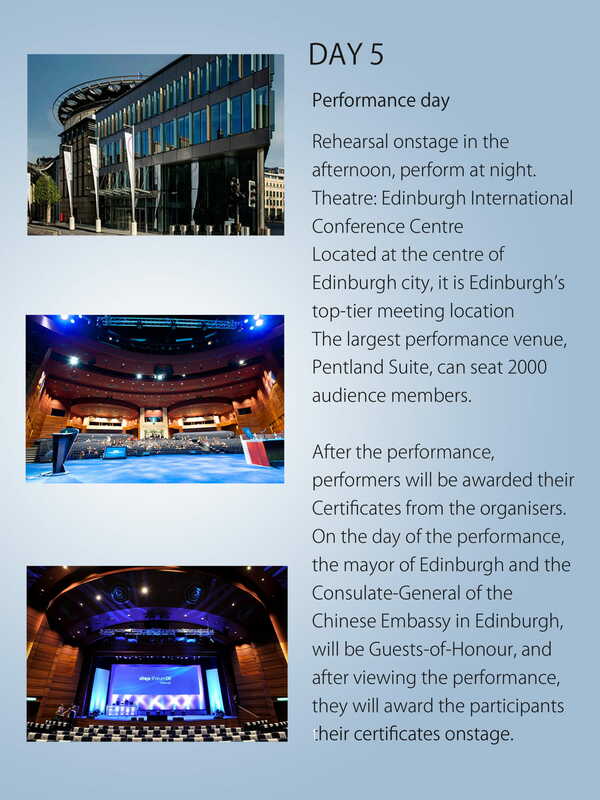 The largest performance venue, Pentland Suite, can seat 2000 audience members. 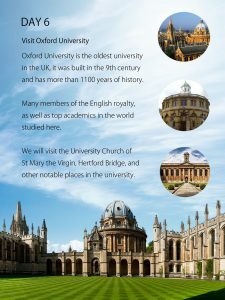 Oxford University is the oldest university in the UK, it was built in the 9th century and has more than 1100 years of history. Many members of the English royalty, as well as top academics in the world, studied here. 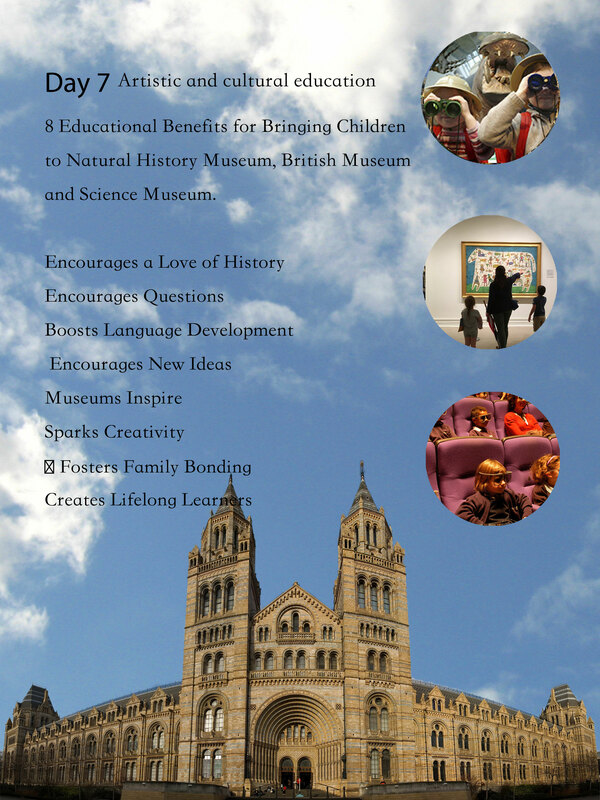 Visit the Natural History Museum, British Museum and the Science Museum with a tour guide and activities. Parliament, Horse Guards, The River Thames, Tower Bridge and Chinatown.